Kriseman has continued to make unilateral decisions without City Council input. Rick Kriseman seems to have missed the fact he was elected Mayor of St. Petersburg not anointed. From the very outset, Kriseman has pushed the limits of the strong Mayor. Immediately upon entering office, he appointed two of his top political aids Kevin King and Ben Kirby to highly paid staff positions, making him the first strong St. Petersburg Mayor to practice open cronyism. His failure to respect the public's view of the Pier and deliberately manipulating the Pier selection process have left many with declining respect for the Mayor. The poor handling and cover-up of the facts around recent waste water discharges into the Bay, and Clam Bayou have people questioning his honesty and integrity. Kriseman is the first St. Petersburg strong Mayor to create his own "Communications Director" to distribute what at times could best be described as propaganda. 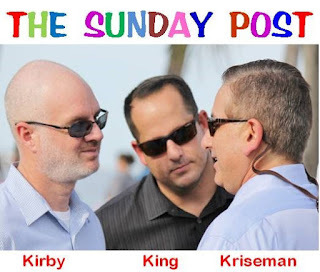 The problem is getting worse with City Council as reported by John Romano in the Tampa Bay Times article Tension between Kriseman, council becoming harder to ignore. Kriseman's first City Council terms resulted in lackluster accomplishment along with some hijinks. His terms in the State legislature were mostly marked by his failure to work with his fellow legislators and accomplish any significant legislative trail. The talk was he didn't work well with his fellow legislators. Now, here in St. Petersburg, Kriseman and his Chief of Staff seem to be following the Kriseman pattern and alienating City Council and staff. We are currently just about half way through Kriseman's first term. If you read the Ben Kirby propaganda post SUNblast, you would come away thinking all is well. However, on key issues like crime in south St. Pete, failing schools, job creation, the Rays, building a pier "the people want" and transparency on major issues like the waste-water spill the Kriseman administration is coming up short. Kriseman has about six to eight months before he begins to consider running for a second term. How long will the Mayor keep his two top political operatives on the City payroll as we head for the next mayoral election? Will he work to improve relations with City Council? Will any of the current or soon to be elected City Council members support a Kriseman second term? Will he live up to his campaign promises of transparency? Kriseman has a lot of work to do for the City and for his reelection.